Armed robberies occur everyday around the world. Though it is not something you may want to think, you could find yourself in the middle of one in your lifetime. Being prepared will help ensure a positive outcome. Here are some tips for being in an armed robbery situation. First and foremost, you must try to remain calm. This can be very difficult, given the circumstances of what is going on. But, panicking will cloud your thinking and judgment and send you into disarray. When you remain calm, you will be able to better read the robber and better remember details you will want to give the police later on. To remain calm, tell yourself you will be fine and you will be okay in the end. Listen to everything the robber has to say. Whatever he asks you to do, do it. It is common for victims of armed robbery to try to be the hero, but unlike what you see in the movies, this usually does not end with positive results. Follow the robber’s commands and also ask for permission to make any moves. For example, if he asks you to take money out of the cash register, ask him if it is okay for you to move your hands to get to the money. Avoid making eye contact with the robber and do not stare at him. By doing either of these things, the robber is going to think you are trying to memorize details of their appearance to give to the police. This will make them paranoid or angry and will make it more likely for them to hurt you and any others that may be with you. Most armed robbers have little to no patience. Therefore, try to keep any talk with him to a minimum. If he asks you a question, go ahead and answer but do not go into a long-drawn response. Even if the robber is yelling or screaming, answer in a calm voice. Do not call the police until you are sure the robber has left. Once you know he is gone, lock all windows and doors and then call the police. This way, he cannot get back in and you are preserving the scene of the crime for the police. In conclusion, armed robberies can happen to any of us, at any time. 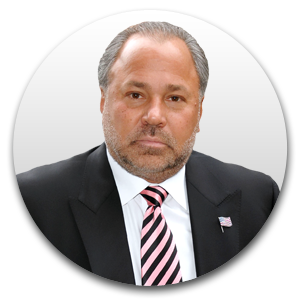 With the above tips, you will be properly prepared if you should find yourself in such a circumstance. 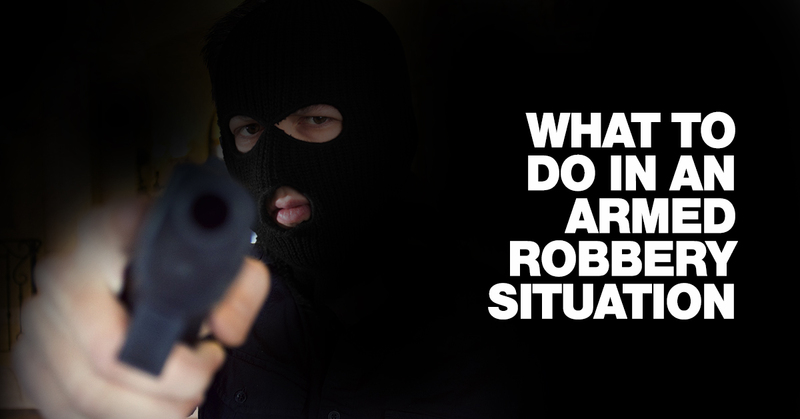 What-To-Do-In-An-Armed-Robbery-Situation Armed robberies occur everyday around the world. Though it is not something you may want to think, you could find yourself in the middle of one in your lifetime. Being prepared will help ensure a positive outcome. 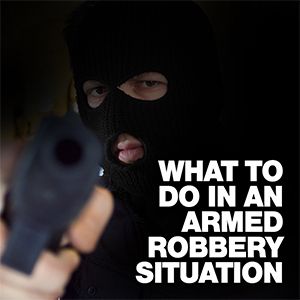 Here are some tips for being in an armed robbery situation. First and foremost, you must try to remain calm. This can be very difficult, given the circumstances of what is going on. But, panicking will cloud your thinking and judgment and send you into disarray. When you remain calm, you will be able to better read the robber and better remember details you will want to give the police later on. To remain calm, tell yourself you will be fine and you will be okay in the end. Listen to everything the robber has to say. Whatever he asks you to do, do it. It is common for victims of armed robbery to try to be the hero, but unlike what you see in the movies, this usually does not end with positive results. Follow the robber's commands and also ask for permission to make any moves. For example, if he asks you to take money out of the cash register, ask him if it is okay for you to move your hands to get to the money. Avoid making eye contact with the robber and do not stare at him. By doing either of these things, the robber is going to think you are trying to memorize details of their appearance to give to the police. This will make them paranoid or angry and will make it more likely for them to hurt you and any others that may be with you. Most armed robbers have little to no patience. Therefore, try to keep any talk with him to a minimum. If he asks you a question, go ahead and answer but do not go into a long-drawn response. Even if the robber is yelling or screaming, answer in a calm voice. Do not call the police until you are sure the robber has left. Once you know he is gone, lock all windows and doors and then call the police. This way, he cannot get back in and you are preserving the scene of the crime for the police. In conclusion, armed robberies can happen to any of us, at any time. With the above tips, you will be properly prepared if you should find yourself in such a circumstance.